Posh chairman Darragh MacAnthony (left) with club chief executive Bob Symns. Peterborough United chairman Darragh MacAnthony has confirmed he remains committed to the club. In February, 2016, MacAnthony pledged to look for new owners if Posh failed to secure promotion back to the Championship by the end of the current season. But Posh have suffered a post-Christmas collapse for the second season in a row. 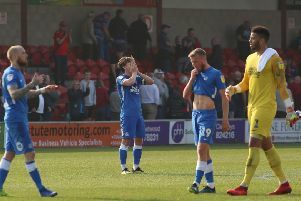 Saturday’s (March 18) disappointing 1-1 home draw with Oldham left them 12th in League One with just seven matches to go. However MacAnthony intends to carry on at the helm. MacAnthony also revealed he has never considered sacking manager Grant McCann despite Posh picking up just 15 points from a possible 48 in 2017. “No-one escapes criticism for this diabolical 2017 form, and I mean no-one,” MacAnthony added. “The manager hasn’t lost the dressing room. I’ve seen dressing rooms lost before. However this dressing room needs to start winning games for sure. Read MacAnthony’s words from last year here.